With polling in the sugarcane belt of Western Uttar Pradesh starting Thursday onward, the farmers’ outstanding in the country’s largest sugarcane and sugar producing region is likely to ease by nearly 40% in the next couple of days. This will provide some respite to Adityanath government against the backdrop of the opposition sharpening attacks over mounting sugarcane arrears, which are currently hovering above Rs 10,000 crore. While, the government had recently released Rs 1,100 crore for the private and state-owned sugar mills, private millers in UP have been sanctioned about Rs 3,000 crore under the central sponsored soft loan scheme for the current crushing season 2018-19. 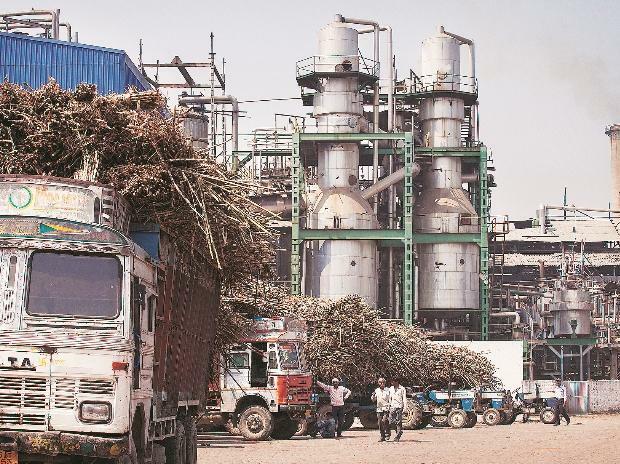 UP cane commissioner Sanjay Bhoosreddy told Business Standard the beneficiary sugar mills had started to receive soft loans, which would be used by them to settle their outstanding. “Nearly, Rs 900 crore of soft loans were released yesterday, while another large chunk is likely to be released today,” he said, adding that the remaining of these funds would be disbursed to the respective units within a couple of days. This way, UP sugarcane arrears of over Rs 10,000 crore are likely to diminish by almost 40%, taking into the account the soft loan of Rs 3,000 crore and Rs 1,100 crore released by the state government for private and cooperative mills. While the state had released Rs 500 crore against cane dues on 24 government controlled cooperatives mills, state power utility UP Power Corporation Limited (UPPCL) had released Rs 600 crore to sugar mills against the purchase of cogenerated power. However, the Western UP constituencies, which would witness polling in the initial phases, may not benefit in the same proportion as nearly 60% of the total arrears are from the region. Bajaj Hindusthan and Simbhaoli Groups could not avail of the soft loan scheme owing to stringent eligibility criteria. Besides, the mills have been directed to operate until all ‘bonded sugarcane’ in their respective areas has been exhausted, thus ensuring they would be operational through the polling process in UP. The crushing season is expected to continue through May end. The issue of sugarcane payments has always been a burning political issue in UP with regional parties and organisations, including Rashtriya Lok Dal (RLD) and Bharatiya Kisan Union (BKU) owing their elevation to representing cane farmers and the cash commodity. In the maiden ‘Mahagathbandhan’ rally on Sunday in Saharanpur, Bahujan Samaj Party (BSP) president Mayawati had attacked the Adityanath government over mounting arrears and pointed out that during her regime (2007-12), cane payments were prompt and her dispensation did not hesitate in putting defaulting private sugar millers behind bars if needed. Samajwadi Party (SP) chief Akhilesh Yadav and RLD supremo Ajit Singh also and castigated the BJP over its failure to honour its promise of ensuring timely settlement of arrears. Polling in UP will move from Western UP towards the eastern UP constituencies in phases to be held on April 11, 18, 23, 29, May 6, 12 and 19. The state government said that it had facilitated total cane payments of over Rs 60,000 crore to farmers despite challenging market conditions over the last two years.